But, how realistic was this hope considering that the experts in question – international scholars of a progressivist bent – were none other than the promoters of the Liturgical Movement led by Bugnini? These were the men who colluded in secret to produce the revised Holy Week rites and other liturgical changes that were imposed on the Church in the 1950s. In fact, some of them were participants at the Assisi Congress, basking in the warmth of the Pope’s praise. Jungmann would eventually play a major role in the drafting and implementation of Vatican II’s Constitution on the Liturgy and, also, in the fabrication of the Novus Ordo. 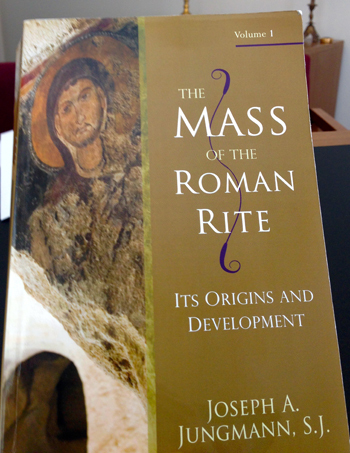 Josef Jungmann published his magnum opus on the history of the Roman Rite, Missarum Sollemnia, in 1948, (4) (see here) which was long hailed as a classic of liturgical scholarship and became the ultimate reference and definitive resource book for the Liturgical Movement. But, it turned out that Jungmann was ascribed authoritative status not through excellence in research integrity, but largely because he upheld the progressivist ideas of the liturgical establishment. It is now known that he “mined” the field of early Christian liturgies to produce data that supported his “antiquarian” agenda. More recent scholarly research (8) has shown conclusively that Jungmann’s work was riddled with erroneous assumptions about the early Christian liturgies: he often hypothesized about events that he would like to have happened – for instance Mass celebrated versus populum (facing the people), an Offertory procession, bidding prayers at all Masses – thereby assuming tacitly that they did. And he did not scruple to skew the evidence in favor of his own preconceptions. One could say that, in some areas, Jungmann raised the falsification of data to an art form. It was only later that he came to realize his error about versus populum liturgies. But, he said this orientation should nevertheless be adopted for “pastoral” purposes, thus laying bare the real reason for undertaking his research in the first place. Unfortunately, Pius XII, via Bugnini, relied on Jungmann’s compromised research for the Holy Week reforms and decided that some key aspects of it could be imported into the liturgy at the stroke of the Supreme Legislator’s pen. While many of his fellow priests were suffering and dying for the Faith in war-torn Europe, Jungmann spent most of WW2 comfortably ensconced in a convent in the Austrian countryside, (9) which he used as the perfect hide-away in which to research for and write his history of the Mass. There, like a captious pedant, he busied himself finding fault with almost every aspect of the Roman Rite as it had been celebrated over the previous 1500 years. While all of these positions were directly contrary to Catholic doctrine, the last two were the subject of a special condemnation at the Council of Trent. To those liturgists present at the Assisi Congress who included Jungmann among their number, Pius XII said in his Address that it was “a consolation and a joy for us to know that we can rely on your help and your understanding in these matters.” But the aim of the Liturgical Movement was to restructure the Mass so that it would no longer reflect essential Catholic doctrine, an aim that would be eventually realized in the creation of the Novus Ordo. Thus, he trusted “men with itching ears” (2 Tim 4:3) with the reform of the liturgy, men whose theology represented the “striking departure from the Catholic theology of the Mass as it was formulated in session XXII of the Council of Trent,” mentioned later by Cardinal Ottaviani with reference to the Novus Ordo. Apud Alcuin Reid, The Organic Development of the Liturgy, p. 186, as a letter to the author. It has been claimed that “It is impossible to overestimate the contribution of Josef Jungmann to the Second Vatican Council, above all, to the pastoral renewal of the liturgy – to the momentum for reform that had been gathering for decades, to the climate in which it unfolded, to its preparations, inner workings, implementation and reception around the world. By the time the Council was announced Jungmann was already the elder statesman of the liturgical movement whose writing, teaching and preaching had formed a generation of pastors and scholars.” Kathleen Hughes, “Jungmann’s Influence on Vatican II: Meticulous Scholarship at the Service of a Living Liturgy,” in Joanne M. Pierce and Michael Downey eds., Source and Summit: Commemorating Josef A. Jungmann, SJ, Collegeville: Liturgical Press, 1999, p. 21. A. Bugnini, Reform of the Liturgy 1948-75, pp. 11-12. 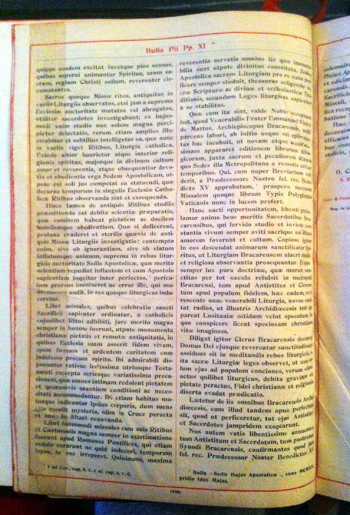 The first English edition was translated from German by Francis A. Brunner, CSSR, and entitled The Mass of the Roman Rite: Its origins and development, 2 vol., New York: Benzinger Brothers, 1951. Louis Bouyer, Liturgical Piety, Notre Dame, Ind: University of Notre Dame Press, 1955, p. 16. Joseph Ratzinger, Preface to the French edition of Reform of the Roman Liturgy by Msgr. Klaus Gamber. See, for example, Klaus Gamber, Reform of the Roman Liturgy: Its Problems and Background, 1993, p. 5; Alcuin Reid, Organic Development of the Liturgy, 2004, pp. 151-159; and Eamon Duffy, “Fields of Faith: Theology and Religious Studies for the Twenty-first Century” in Worship, 2005, who showed convincingly that “there is in fact no warrant for supposing that an offertory procession … was ever a feature of the Roman Mass.” p. 120. So how could it be realistically “restored,” as the reformers demanded? 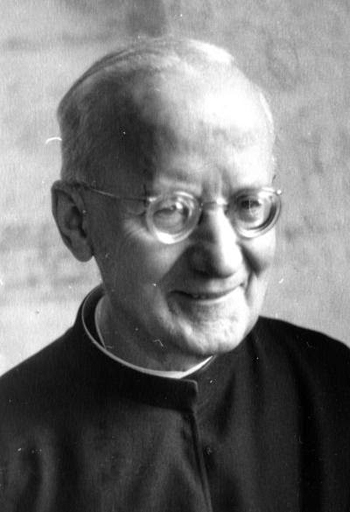 When the Nazis closed down the University of Innsbruck’s Jesuit College in 1939, where Jungmann was teaching, he quickly packed his bags and decamped first to a residence in Vienna and, then, to a convent in Hainstetten run by the School Sisters of St. Polten. During World War II, a '”funk hole” was a small private hotel or guest house in a remote part of the country where those with the necessary money could stay as permanent guests in safety and comfort. These included the prayers at the foot of the altar, the silent prayers of the priest including most of the Lavabo and part of the Canon and the Last Gospel. “At a minimum we would have to say today: In order that any of these prayers be retained, a justifying reason must, in each single case, be adducible.” (J. A. Jungmann, “Problems of the Missal,” Worship, vol. 28, n. 3, 1953/4, p. 155. 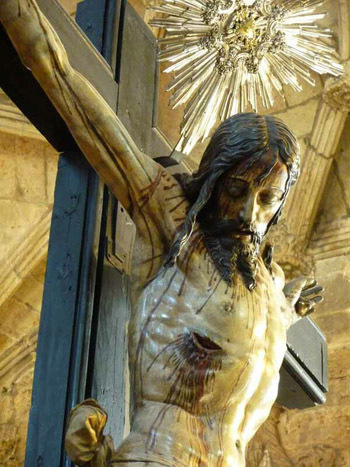 "Since the Council of Trent, the understanding of the sacrifice of the Mass has often been obstructed by the apologetic tendency to overstrain its identity with the sacrifice of the Cross. … Exclusive stress upon the sacrifice of Christ, and unrestricted identification of the Mass with the sacrifice of Calvary, along with the ignoring of what we, as the Church, have to seek to do on our part, leads us away from the true liturgy of the Mass. … The sacrifice of the Mass is not the sacrifice for the redemption of the world, but the sacrifice made by the redeemed.” Josef A. Jungmann, Announcing the Word of God, trans. from the German by Ronald Walls, London: Burns and Oates, 1967, pp. 114 and 117. “What is meant by the words Mysterium Fidei? Christian antiquity would not have referred them so much to the obscurity of what is here hidden from the senses, but accessible (in part) only to (subjective) faith. Rather it would have taken them as a reference to the grace-laden sacramentum in which the entire objective faith, the whole divine order of salvation is comprised. The chalice of the New Testament is the life-giving symbol of truth, the sanctuary of our belief. How or when or why this insertion was made, or what external event occasioned it, cannot readily be ascertained.” J. A. Jungmann, The Mass of the Roman Rite: Its origin and development, Benzinger Brothers, 1950, vol. 2, pp. 200-201. “I am sure it was not a mere accident that the primitive Church did not apply the term ιερευς [hiereus, “priest”] to either bishop or presbyter. … For, there is only one mediator between God and man, Jesus Christ. … The term ιερευς was therefore applicable only to Christ and to the whole communion of the faithful, the holy Church, insofar as it is joined to Christ.” J. A. Jungmann, The Early Liturgy: To the Time of Gregory the Great, University of Notre Dame Press., 1959. “The liturgy, the public worship of the Church, which in early times set the rhythm of Christian devotion, was, in the Middle Ages, put further and further in the background in favor of private and lay devotion. Hence subjectivism and individualism in the religious life of Catholics came strongly to the forefront. All too much leeway was given to human action in opposition to the operation of divine grace. So liturgical worship languished more and more and finally became a function of the priest, at which the people, during the liturgy and in place of it, gave themselves to private devotions. … A preliminary step to this divide was the proliferation of personal prayers, recited in a low voice by the priest. With such prayers, he already began to execute his own private ritual during the Mass.” J.A. Jungmann, The Mass of the Roman Rite, vol. 1, pp. 84, 104. 16. For the full text of his speech (in French), see J. A. Jungmann, “La Pastorale, Clef de L’Histoire Liturgique,” (The Pastoral Approach, Key to the History of the Liturgy) La Maison-Dieu, n. 47-48, 1956. He criticized the silent prayers of the priest as a barrier preventing the faithful from entering into the liturgy. He compared the Canon to a veil that separated the faithful from true participation in the Mass.